Vera Bradley creates a distinctive line of superior quality handbags, travel items, luggage, stationery, eyewear and accessories.The Vera Bradley story is a testimony to the American Dream. While on vacation in March of 1982, Patricia and Barbara were awaiting a flight in Atlanta when they noticed a definite lack of feminine-looking luggage. The longtime friends wasted no time in correcting this situation. Within weeks, these dynamic women had created a company, named after Barbara's mother, capable of marketing and manufacturing their cleverly designed products. The demand for these unique handbags and luggage items has grown and so has Vera Bradley, which is now nationally and internationally recognized. For over 20 years, Vera Bradley has had a loyal following of customers who not only look forward to our lovely new fabrics and styles that are introduced each season, but who also appreciate the function and quality that is synonymous with our name. Like the princess, I too like comfort and style....two thing's that are VERY hard to come by. 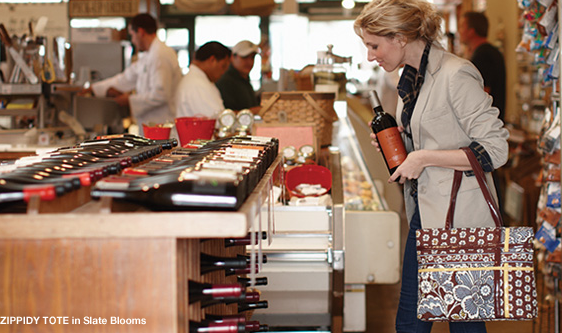 Vera Bradley offers both in her beautifully designed bags and accessories! 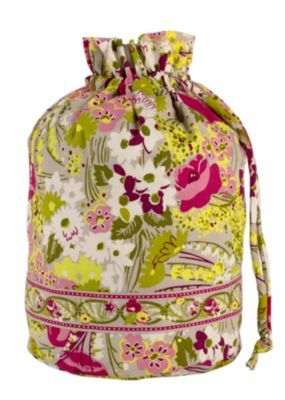 I was thrilled to have the opportunity to review three of Vera Bradley's Popular bags ( the Baby Bag, Ditty Bag, and Cooler pictured below); with gorgeous pops of color and patterns. The Baby Bag, has a soft (trimmed in matching fabric) terry changing pad included and multiple pockets ( the outer pockets are automatically secured with magnetic closures concealed under beautiful fabric- a definite plus - for who wants to juggle with the bag, baby, stroller.....well I could go on...however, mom's YOU KNOW OF THAT WHICH I REFER!) it's an absolute essential for stylish mom's and mom's to be (what a great baby shower gift!). The Ditty Bag is fully lined with plastic, so it's ready for nearly anything! Pack lunch, use it for wet clothes in the diaper bag......for whatever purpose you may use it, it's totally up for the job (without sacrificing on style ;). 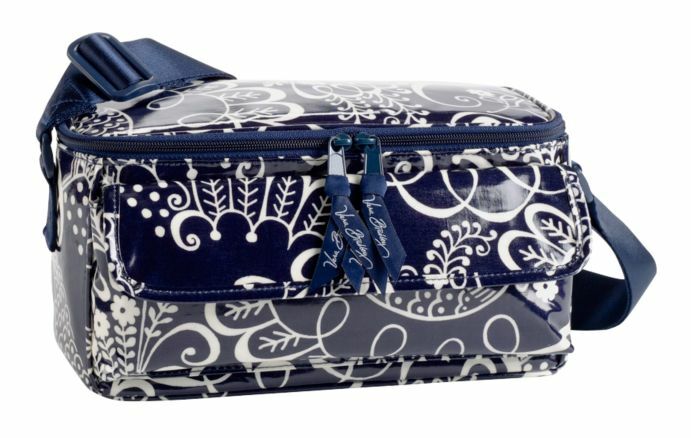 The Vera Bradley Cooler (fully laminated on the outside, also with a wipeable lined and insulated inside) is so chic! I carry this bag with me everywhere...we've toted lunch to the park, and it's successfully kept the kids juice boxes, and water cool when we headed out this summer on smoldering hot days. I am proud to carry Vera Bradley bags! Their graceful style and function, in my opinion; is essential to every stylish mommy! Experience the graceful style of Vera Bradley! One Lucky Reader will receive the Baby Bag, Ditty Bag, and a cooler Bag! Visit Vera Bradley and let me know another style and pattern that you love! The comment is considered your entry. DISCLOSURE: A product sample was provided for review. I was not required to write a positive review. The opinions I have expressed in this post are my own. I am disclosing this in accordance with the Federal Trade Commission’s 16 CFR, Part 255. I love the Raspberry fizz (and am a GFC subscriber). | SKU #11303061 | 8½" x 9½" with 25½" strap drop! I am a public follower or GFC. I already follow on Twitter under onedesertrose. I have always liked the bowler bag in twirly bird navy or imperial toile. I love the Hipster in Black Microfiber. I "Like" Vera Bradley on FACEBOOK 1. 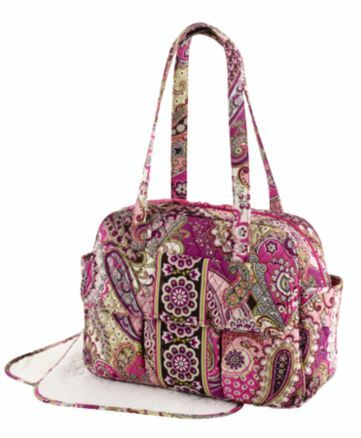 I "Like" Vera Bradley on FACEBOOK 2. I "Like" Vera Bradley on FACEBOOK 3. I "Like" Vera Bradley on FACEBOOK 4. I "Like" Vera Bradley on FACEBOOK 5. I entered your Joovy Caboose Stroller Giveaway 1. I entered your Joovy Caboose Stroller Giveaway 2. I follow you. I like the very berry paisley zippidy tote. I like the yellow bird print! I like the wildwood park pattern. I like the checkbook wallet or tote. I LOVE Vera Bradley. I currently carry a Sitting in a Tree Baby Bag, I love it. The new Baroque pattern is awesome. I entered the Kindle Give Away. I liked Vera Bradley on FB. Their Lisa B in Poppy Fields caught my eye! 2)Subscribed to the blog RSS feed. 3)Subscribed to the blog RSS feed. 4)Subscribed to the blog RSS feed. 5)Subscribed to the blog RSS feed.